The upcoming Galaxy S9 and Galaxy S9+ could feature a front-facing fingerprint scanner to combat criticism the Galaxy Note 8 and Galaxy S8 received, suggests a patent Samsung filed for with KIPRIS, South Korea’s trademarking organization. 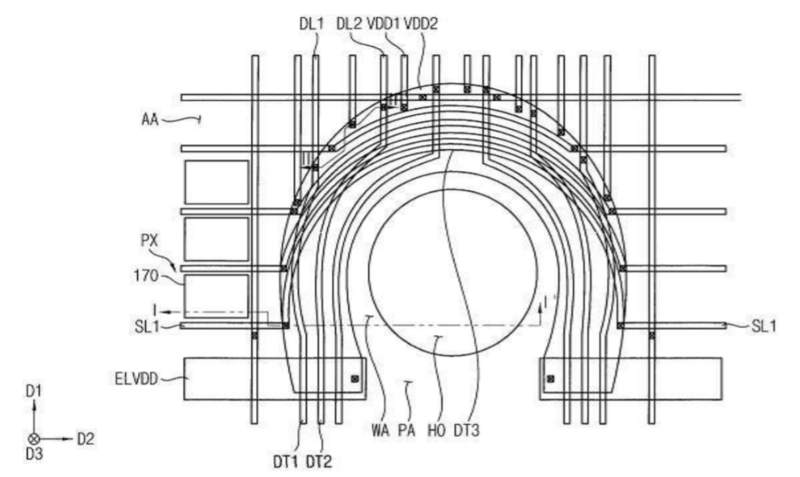 If the information included in the patent documentation is accurate, the firm is planning on building a small recess (think: Essential Phone) into the bottom of the Galaxy S9 that will house a small super-fast fingerprint reader. We’re not sure a recess is the best route to go down—and it doesn’t look like our readers do, either. According to a poll we ran last month, the majority of voters would hate to see a notch à la iPhone X on board Samsung’s next flagship. The Galaxy S9 is expected to sport the same 5.8-inch Infinity Display as the Galaxy S8, while the Galaxy S9+ should pack an identical 6.2-inch Infinity Display to the Galaxy S8+. They’re both tipped to sport a Snapdragon 845 CPU and 6GB of RAM. Huawei mate 10 managed to put a fingerprint reader on that thin chin bezel, why can’t Samsung do the same? The super bezeless race is becoming a little bit over the top. We need a little bit of bezel at the top and bottom. S8/Note 8 – ill placed scanner, iPhoneX – no scanner and big notch, Essential – notch, S9 – maybe more notches. Thats what you get when you rush to have infinity displays without the tech to back the compromises up. I have found from the S8 that on the small bottom edge there is already enough space for a digital sensor in the front without having to raise the edge or under the screen. I don’t usually swear but f*** notches. They make your phone fugly as hell when viewing a full-screen content! I just hope that the under-display FPS would be the biggest feature on the Note9. I’d be open to it. The sensor on the Note 8 is very difficult to get the correct finger placement. It’s not a seamless transition as one would expect. Samsung would be dumb and stupid enough if they decide to put super ugly notch on their phone..better rear fingerprint sensor than ruin their beautiful symmetry display design by put those f*cking ugly bottom notch.. Okay, if they have a permanent nav bar either side of the home button, that’ll make sense. and have that nav bar be black and invisible when not in use to give the appearance of a full screen, then that COULD work. We do NOT want an Essential phone and Apple notch look – they are not practical and just ugly. Also a side note: KEEP THE HEADPHONE JACK PLEASE! I’m totally against any form of a notch, but this actually makes sense. If the recess sat where the virtual home button usually is, and the rest of the nav bar ran out from each side of the nav bar, you don’t really lose any space at all, apart from immersive apps that take up the whole 18.5:9 screen and hide the nav bar. Not how I’d prefer it, but it’s definitely a LOT more practical than Apple or Essential’s notches. I rather they just place the FPS in the back on the Samsung logo if they can’t put it under the screen.